For the protection of motorists and others in case of storm, a waterproof, overall suit has been manufactured that can be slipped on or off in a few seconds, has no bothersome buttons, allows freedom in movement, and covers the entire figure. It is composed of two plys of strong fabric between which is a layer of rubber. Patented fasteners at the front, wrists and ankles are quickly adjusted. 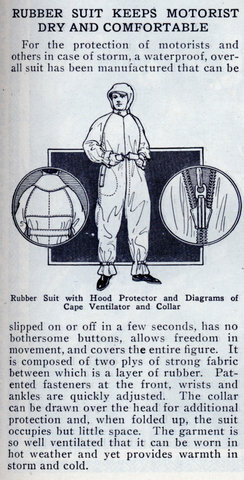 The collar can be drawn over the head for additional protection and, when folded up, the suit occupies but little space. The garment is so well ventilated that it can be worn in hot weather and yet provides warmth in storm and cold. Little-known fact: All-over body sweating didn’t develop in humans until the late 1940s. So the person wearing an all-rubber suit back when this thing was developed didn’t have to worry about dissolving into a puddle of goo. Note that the word ‘zipper’ is no where to be found. The B. F. Goodrich Company coined the name “Zipper” in 1923 for the line of rubber overshoes that it made using the fastener. 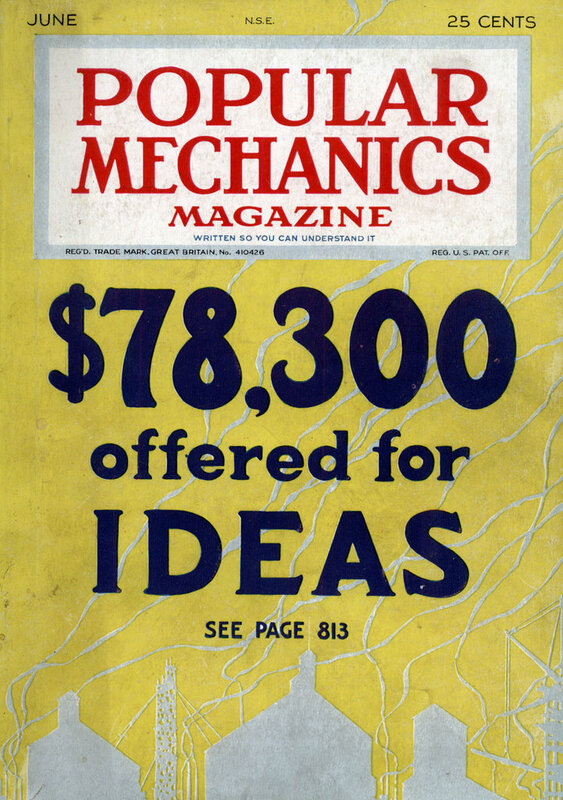 The name slowly came to be associated with the fastener itself, and eventually acquired generic status. In the 1920s, closed cars were becoming more andmore popular every year- by 1924 it must have almost reached 50-50.